In 1891, George C. Blickensderfer (1850-1917) invented a small portable writing machine that featured the ability to change type styles at will. This unique design formed the basis of a typewriter manufacturing business that lasted almost thirty years. Models 1, 2, & 3 apparently were made in very limited numbers because none have been found to date. The Model No. 5, introduced in 1893 at the Columbian Exposition, was manufactured for many years and sold primarily to price conscious buyers. US collector Rob Blickensderfer (yes, a relative) has done extensive research into the history of the Blickensderfer for the Typex Newsletter. His conclusion is that production of the Blickensderfer 5 did not get seriously underway until 1895/96. 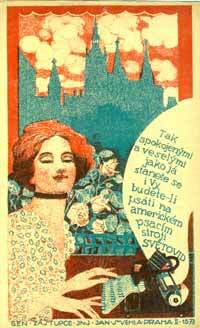 In 1896 the machine apparently broke through and production increased sharply. The machine presented here (serial number 31785) would have been built in 1899. The Blick 5 appeared in a number of disguises. In 1906 Blickensderfer introduced the Blickensderfer 6, which was in fact a Blick 5 with an aluminium frame. The aluminium version also appeared as the Blick featherweight and as a regular Blickensderfer 5. Also, from the moment the machine was introduced, the Blick 5 went through a series of minor changes. A sample of the earliest Blick 5s appeared on the market in France as the Dactyle. See the entry about the Dactyle for some of the differences with later Blick 5s as the one presented here. 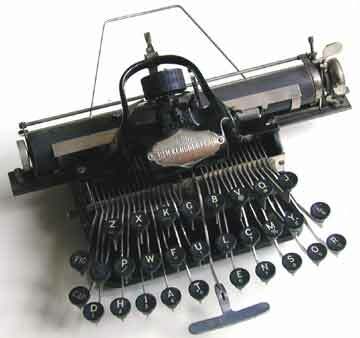 See the extensive special feature about the Blickensderfer in the book â€œTypewriterâ€� on page 134.